Need a ride? Message board inside an Amish bent-n-dent store in Ohio. By the look of that torn-up ad on the left, old fashioned advertising still works. Besides the many Amish taxis, you could also find an ad for child care by an Amish woman. 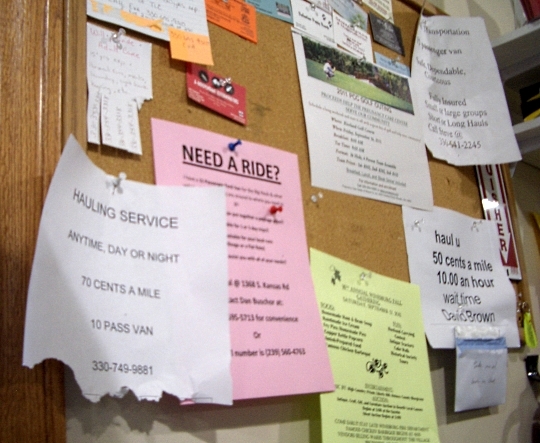 Message boards are still a fixture in some places, for instance country stores. Do you still have anything to do with them? In our local grocery store, post office, Village Hall and more are message boards in my town. On them they have announcements of bazzars, rummage sale, lost a pet, church dinners, even houses for sale are on them. I always take a look at the one at the grocery store after I check out. It is very interesting to look at. As I write a monthly paper for the apartment complex I live in – I put many of the local activities in it that I think they people would be interested in. Most of them come from message boards. The ad for child care by an Amish woman is interesting. I wonder if she would be willing to keep English children. There is probably a great market for that. I can imagine many English parents that would love for their youngsters to get the Amish farm experience. Our community still uses message boards in grocery stores. Many people here are not internet savvy and we don’t get local delivery of a newspaper, so scanning the message board after shopping keeps people informed of community activities and small business offerings. It is usually things like snowplowing, trash hauling, church events, pets or livestock for sale, garage sales and occasionally household goods to be sold or given away. My husband has an Amish taxi business ,right now he’s currently working with a crew , not just driving them to work but doing construction right along side of them , he really enjoys it . Around Middlefield /Mespo message boards are everywhere , we also have “free ad” that come weekly ( Free Press , Middlefield Good News ) that the Amish use a lot ! I think that’s more often the case with Amish child care–watching your children in your home rather than theirs. That said, in my book-selling days I sometimes came across Amish moms watching one or two English kids in their own homes–not sure if those were non-Amish grandkids or relatives or English neighbor kids perhaps. Either way I can see how an Amish day care would be appealing to English parents. I don’t know of any official Amish day care center; maybe there are regulatory hurdles (certification?) that would prevent that (and assuming it would fly in the given community, of course). Ok, maybe I’m romanticizing a bit, but maybe not — I’m thinking if I had kids and couldn’t watch them during the day, dropping them off for a day with an Amish family instead of daycare / pre-K was an option…it would be a very good option! BTW, message boards are popular here. I usually get a coffee once a week at the donut shop which has one big board, and the there’s another interesting one at the entrance the feed co-op I get my dog food at. For that matter, we have a REALLY GREAT locally owned AM radio station. This morning they had an announcement of a German Shepardh pup who had been found at a cafe this morning, and was now at the dog groomers…hoping to find his owners. (For that matter, at least I was brought up and I’m sure others in town is if the dog is no bother you at least keep them at your home for a few days — just call the dog warden and let them know you have it and what tags are on it in case anyone calls them looking). Matt sometimes I think I’d love to live in a place where lost pups get announced on the radio. Something wholly charming and reassuring about that. For that matter, we have a REALLY GREAT locally owned AM radio station. This morning they had an announcement of a German Shepardh pup who had been found at a cafe this morning, and was now at the dog groomers…hoping to find his owners. There are Message Boards here in the feed stores, many grocery stores, & many private businesses & restaurants, though none Amish I’m aware of. And yes, I have made use of both the messages & the boards. I wish there were Amish nearby, offering housecleaning & various other services. With increasing sustainable gardening interests in our state, their selling of organic produce might result in increasingly merrier & healthy people. There are Amish in the state, but none in the most northern areas. At the moment I could go for a bit of Amish baking. . . think gooey cinnamon caramel pecan rolls with homemade butter, though I don’t proclaim this might make me more healthy, but definitely merrier. I think most grocery stores still have message boards; at least, I’ve seen them everywhere I’ve lived. They’re still a great place for notices too small to go in newspapers — lost or found pets, pet walking services, etc. And I know I would have loved to be able to hire an Amish woman or girl for child care — and I’m sure my kids would have loved it, too. I tried to expose them to many different people of many different beliefs, so that they’d grow up respecting the differences around them, and one-on-one exposure to the Amish world would have been really terrific for them. Times have changed. My community has a online message board that is used for announcements and a place to advertise small businesses. I guess even the message board could not resist the change of the information age. Tom I wasn’t totally sure what to call this post–when “message board” came to mind I started to think of the online version. But I guess the name of the online version came from somewhere, like email and chat room and so on. I wonder if we’ll ever have to explain to kids the origin of terms like “email”–there used to be a network of people who would actually bring paper documents to your home! Can you believe that? Actually, with the junk mail industry still seeming to go full-bore, I kind of doubt it will come to that. Most of the feed stores and gentlemen-farmer stores around here (West-Central Indiana) have message boards. Some of the smaller businesses, especially gas stations, have them. There is even one in the courthouse. I usually add one of our cards for our soap business to each message board I see. Yesterday, I was in a local gas station and was surprised to see a very nice business card holder for the patrons to use. It has room for 16 different cards. I live in a remote rural community in Northern California and there are many people here who do not have Internet access nor do they receive the local paper. There are message boards at the feed store, small local markets and at the end of our road where the mailboxes are located. You see messages about lost pets, pets for sale, farriers (they shoe horses), farm equipment for sale, vehicles for sale, other services and merchandise. I like to look at the message boards but do not remember buying anything that I found there. Margie and Heather, that makes 2 California comments in a row. Out of curiosity I just checked the geo-breakdown of traffic on this site, and it looks like we get a few thousand visits every month from California. About the furthest state from any Amish, but maybe that is why people are interested. And Heather those ocean shores sound pretty good here on Dec 2 with winter knocking on the door! Here in Maine we have lots of message boards and walls at the gas station, grocery store, post office and banks. There are fliers for suppers, concerts, and many kinds of services like snow plowing, yard work and child care, and lost animals. One of the Amish ladies that I drive for asked me yesterday to make a facebook page for her bakery , so I did. Quite a few likes already. I sure hope it brings her more business now that the summer people have left. Amish bakery on facebook, just another example of differences between settlements. The old order Amish I live by are not comfortable with that sort of advertisement. They will not even sale over the internet on consignment, which would make my business easier, but they like to avoid potential gray areas. Message boards that I have noticed here; vet clinic, bakery, hamburger joint & the county courthouse. Gone are the message boards that use to be at the feedstore and one of the grocery stores. Of course, the grocery store is gone, too. Very cool Oldkat. That’s not how I found my way to selling books, but my way was perhaps equally random–got a phone call one evening in my dorm room. Accepting bids! Seeking Amish Builders to build a 1 story / 3 Bedroom cottage in Kennerdell, PA along Allegheny River. Please contact me at 814-558-4449 or email me at rob_gerlach@yahoo.com and submit quote.